For the longest time, we’ve had a saying among the pastoral staff. It used to be that we thought of January as an opportunity for fresh starts. The turn of the calendar year on New Year’s Day has always provoked the prospect of renewal–complete with resolutions of what that renewed life will look like from day-to-day. On New Year’s Day, we are motivated by the possibility of a clean slate, and we resolve to do new things, like eat healthy, exercise more, spend more time in prayer and Bible study, etc. etc. (Of course, whether we keep those resolutions or not is an entirely different matter.) Nevertheless, we make them in the hope that this turn of the page will truly bring a change that sticks. In a similar way, the post-summer return to school in August brings a spirit of renewal to churches everywhere. There is now, a (predictably) beautiful surge of attendance and engagement that in many ways rivals the kind of energy felt in January. Pastors love it, by the way. We long for it, all Summer long. August is the new January. What resolutions ought the NEW January provoke in our shared life as a congregation? 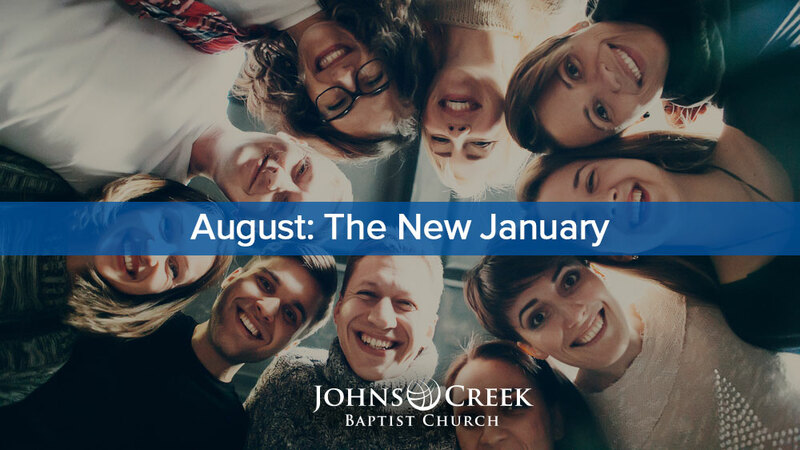 Three resolutions for JCBC members this August…the new January. Set a new individual (or family) “PR” in attendance. The first recommendation is to set a new individual (or family) personal record in attendance. Start by doing what I call an “attendance audit.” Ask yourselves, “what is my (or my family’s) typical frequency pattern when it comes to attending Sunday School and Worship?” Do you attend every Sunday? Is it three times per month? Twice? Once? Be honest. Look at your last 6 months. How many times (per month) is your average church attendance? Figure out your frequency pattern–then, smash your own record. Make it a goal between now and Christmas to come to church every single Sunday! As I mentioned in a recent sermon, sometimes life happens, and it is unavoidable to miss a Sunday. But if we plan to only come one or twice per month, the unavoidable is likely to happen on one of those Sundays. Let’s fix it. There is a cumulative effect to our gathering with one another. We are transformed more and more into the image of the Beloved Son the more often we gather in His name. Frequency matters. What will your PR be this Fall? There may be nothing more spiritual in practice for the Christian, than the deliberate (and routine) contribution of financial support to the ministries of the church. I like to say it this way: When we give, we join God in what God is “up to” in the world. So, giving a percentage of our income is a deliberate way to partner with God. What percentage of your income have you devoted to the One from whom all blessings flow? Do you practice the historic Christian tradition of tithing 10%? If so, great! If not, what IS the percentage of your annual contribution? Is it 1%? Terrific start! Could you imagine 2%? If it is 2, could you imagine 3? Budgeting a deliberate percentage of our income is a way to demonstrate spiritual courage. It says, I trust in God’s ability to provide for me, as I step out in faith. Perhaps this Fall, it is time to take that step. There is nothing more beautiful than church members who love their church so deeply, that they can’t stop talking about it. Is that you? What is it about JCBC that keeps you coming? What is it that feeds and strengthens you? Maybe it’s the vibrancy of our Sunday School communities. Maybe it’s the satisfaction of volunteering in one of our many ministries with children or youth? For you, maybe it’s missions, or perhaps midweek bible studies and small groups. For many it may be our music ministry, or the opportunity to worship in two distinct and exceptional worship services every Sunday. And who knows–for one or two of you, it may even be the sermons. Whatever it is, have you told anyone about it? Anyone at all? The single greatest witness for our church is not the pulpit, but the people. You have a power no preacher can ever replace. You have the power to love your neighbors into the same life-giving church experience that you enjoy every week. So tell them about it. Invite someone. Let them know about an interesting seminar underway in Sunday School. Promise to sit with them in the worship service of their choice. Take them to lunch afterwards. You know how to love. This fall, love somebody to church. I pray that you and your family feel the sense of energy I am talking about. I pray you will ride the wave of that energy this August…the new January. Have I told you how much I love being your pastor? We love this church! We started coming in January, became members a few months after that. The teaching on Sunday is deep and causes thoughtful growth and understanding. And what can I say about the people but that they are ever so friendly! Welcome to our church family! We joined JCBC in 2003 or so. In 2008 we moved to Florida and spent years looking for a church just like JCBC. In 2016 we moved back simply because we missed JCBC. It was not only the staff, the teaching, and the wonderful music we missed, but it was also the friendly, loving and caring church family. It is a very special place and I am glad you found us.